The USDA’s Economic Research Service (ERS) recently released the 2013 Edition of Rural America at a Glance, an annual report that highlights social and economic conditions in rural America. The report found three worrisome trends in rural areas: fewer jobs, population loss, and higher poverty. While the number of jobs in metro areas grew 1.4% from 2012 to 2013, the number of jobs in rural counties dropped 0.1%. This coincides with the first recorded period of population loss in nonmetro areas, as net migration to rural areas decreased between 2010 and 2012. Additionally, the report shows a 30% increase in “high-poverty” nonmetro counties from 2000 to 2011. In 2012, the poverty rate in nonmetro areas (17.7%) remained higher than in metro counties (14.5%). Overall, these trends suggest that it is more important than ever that we help rural families Earn a better living, Keep more of what they earn, and Grow their savings into assets. 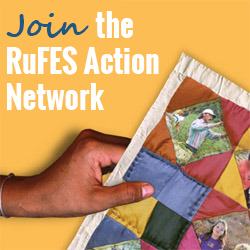 To learn how to help rural families in YOUR community get ahead, join the RuFES Action Network and check out RuFES Action Alerts, Action Ideas, and webinars at rufes.org. Read Rural America at a Glance, 2013 Edition. Read the Daily Yonder article summarizing the USDA report.